Below is my review of the Rev'It! Seesoft Back Protector that was posted to Revzilla's website a couple of months ago, which also gives the necessary info to use a Seesoft with Aerostich jackets. The "other protectors" to which I refer in my review are the Forcefield Pro, Aerostich's TF3 Standard, and the SAS-TEC insert. BTW, I'm still waiting for Revzilla to be restocked on the Seesoft that fits my Rev'It Ignition 2 jacket; I've been using a Knox liberated from another of my jackets. Works great with Aerostich gear, too! I'm waiting for RevZilla to be re-stocked on the KN-106 so I can order one for my Ignition 2 jacket. In the mean time I ordered a Seesoft to try with my Aerostich Roadcrafter and Darien jackets. Aerostich sells an adapter sleeve in order to use its "Transit" back pad (actually a SAS-TEC) in its other jackets, and the Seesoft ST-12 fits right into the size Medium sleeve like it was made to do so. The Seesoft is the most comfortable back protector I've worn of the 4 different brands I've tried; I know it's there, but barely. Other protectors have either dug into my neck or put pressure on the back of my helmet or made me feel like I have a stick strapped to my back while in the riding position. No plans on personally assessing its protective qualities, so I'm putting my faith in the CE L-2 lab testing and results. 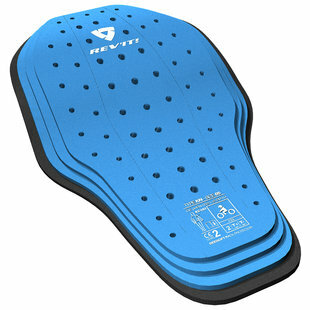 The Airflow rating is relative to other protectors I've tried, which flow little to no air; the Seesoft flows "some" small amount of air, but it's a trade-off for spine protection. I'm happy to have finally found a back protector I can live with on a daily basis, and can't wait until I can buy one for my Ignition 2.